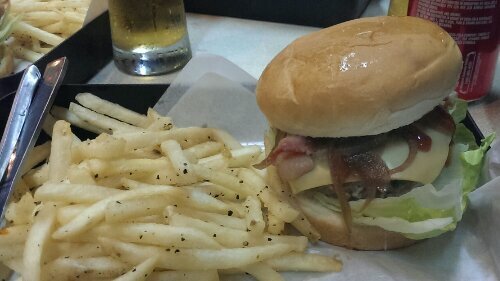 Burger Office @Goldhill Plaza (Singapore) | Get Your Grub On! Where to go when you don’t have much time? Close! That’s right, and that’s exactly what friend’s and I thought yesterday and made our way to ‘Pigsfly Kitchen & Bar’ at Goldhill Plaza. Not really feeling like anything else I ordered ‘The Pervert‘ from the ‘Burger Office’, pretty much their bacon cheese burger. I didn’t hold my hopes up too high as I had their burgers before and wasn’t too impressed. I asked for a spicy sauce when ordering but this request got lost somewhere in the process which wasn’t too bad as the standard bbq sauce is quite tasty and sweet. The toppings in general were okay, the veggies were fresh with a bite, the extra grilled onions were nicely soft and the bacon had a good salty taste but definitely could’ve been way crispier. The bun was soft and too sweet but the biggest letdown really was the beef patty. Even though much firmer than the last time, it actually was pretty lame, under seasoned and tasted like nothing much. The peppered fries were alright but nothing to rave about either. It seemed to have become quite a popular place in the meantime but if I should come back here then only for the Thai stall which has some pretty tasty dishes to offer. Sorry ‘Burger Office’ just not my thing.